Applying technology traditionally used in the Aerospace and Automotive industries, the installation and alignment time of compressor modules for a Movable Modular Liquefaction System (MMLS) was reduced from three months to three weeks. The radical reduction in installation time was achieved using 3D precision metrology equipment such as laser trackers and portable coordinate measuring machines (PCMM's). 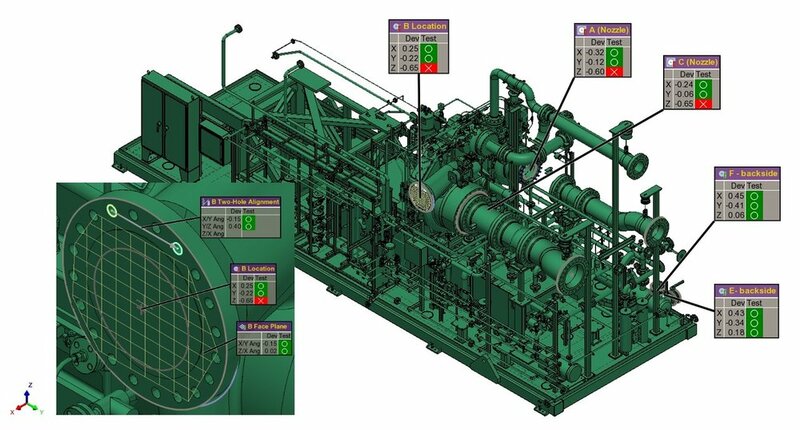 This equipment, coupled with post-processing software, allowed the digitization and Virtual Build and Bolt™ of the compressor flanges and their corresponding inter-connecting piping (ICP). The full digital bolt-up was then analyzed for interface issues between flange faces prior to welding so that field rework could be minimized before shipping the equipment to the installation site. This high precision/high accuracy dimensional inspection and analysis provided optimal alignment preventing costly field-fits and reduced the risks associated with excess joint strain. The Elba Liquefaction Project is a $2.1 billion investment made by Kinder Morgan to upgrade an existing LNG terminal on Elba Island near Savannah, Georgia. This project uses proprietary Shell MMLS technology, in which one large liquefaction plant is modularized into several smaller trains. This greater number of flanges meant an increased risk of failing to abide to ASME PCC-1 "Guidelines for Pressure Boundary Bolted Flange Joint Assembly". In order to mitigate this risk, Dimensional Engineering was contracted to ensure dimensional integrity by certifying flanged joints met center-line, parallelism, rotational two-hole and gap spacing requirements. The data was captured with laser trackers and PCMM’s by way of measuring primitive geometries such as planes, circles, and cylinders. This data was then aligned to CAD models to determine deviations from nominal dimensions. Value added methodologies were introduced to a multi-billion-dollar project by utilizing technology that is new to the Energy industry. The digitization of actual modules and ICP aided the analyzation of critical interfaces before installation. Applying this technology and process to future LNG projects can save EPC's money and time.